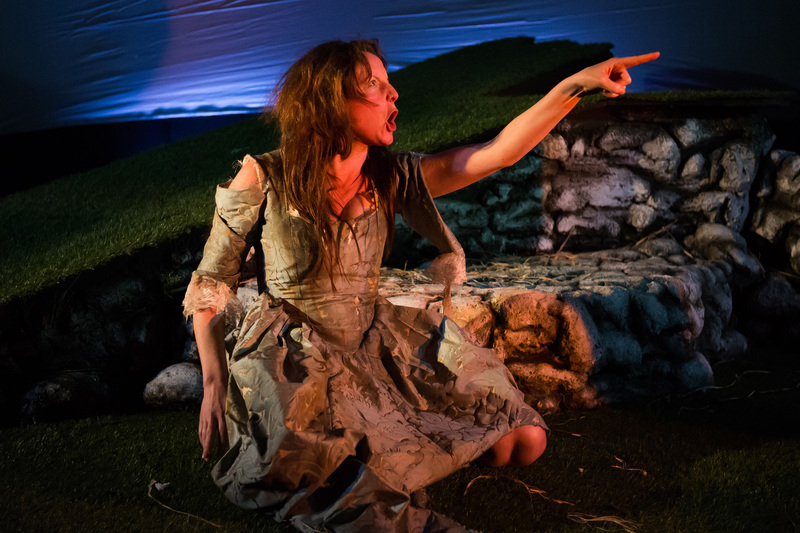 An unassuming little gem of a play, ‘The Straw Chair’ transports its audience to the lost settlement on the Island of Hirta in the St Kilda Archipelago to bring to life a story often forgotten by the history books. The island, aptly represented by a stark and simple set, provides an undeniably alluring backdrop to the true story of Lady Rachel Grange, the “uncomfortable wife” abducted at her husband’s orders from her aristocratic Edinburgh life and imprisoned on the island as her sanity decreases. Sue Glover’s script weaves together Lady Grange’s experience with those of three very different characters she encounters there, and captures the loneliness, desperation, and surprising tenderness of an existence on the edge of civilisation and sanity. Hovering over the play’s early scenes is the threat that it will fall back upon archetypal characterisation. There’s the stoic, patriarchal minister and his timid seventeen year old wife; then there’s a kind hearted and frumpy local woman, and of course the bombastic Lady Grange herself. Excellently portrayed by Selina Boyack, she is erratic, vulgar, and often drunk. There is reason to presume that her character will be reduced a textbook mad-woman-in-the-attic, or, in this case, island. Thankfully, Lady Grange and her counterparts refuse to stay within the neat parameters of their pre-destined roles for long. Any initial flatness in the writing soon gives way to reveal a sophisticated level of wit and a kind of unembellished profundity, as the relationship between these unlikely companions grows and develops. It’s the interactions between these three women that proves to be the most compelling aspect of the play. These are the scenes in which both the writing and acting really come in to their own, and there’s a convincing emotional rawness behind the bickering and bantering. However, this leaves the Minister -the play’s token male character- a little underdeveloped and lacking in the same emotional complexity afforded to the female characters. That said, the play is pretty transparent in its aim of addressing the disaffection of women whose perspectives are erased in a male-dominated world, and it does this so well that any other shortcoming is perhaps easier to overlook. Lady Grange’s treatment at a time when women had no legal rights was deplorable, and the play certainly doesn’t shy away from this. There is a real darkness behind its wry humour, but this never comes to dominate the action. The play is above all a tender one, as full of humanity as it is of tragedy.